In this video we will discuss Model in ASP.NET Core MVC with an example. We want to ultimately, retrieve a specific employee details from the Employees database table and display on the web page as shown below. Model in MVC contains a set of classes that represent data and the logic to manage that data. So, to represent the employee data that we want to display, we use the following Employee class. Model classes in ASP.NET Core does not have to be in the Models folder, but keeping them in a folder named Models is a good practice as it is easier to find them later. In addition to the Employee class that represent the data, model also contains the class that manages the model data. To manage the data i.e to retrieve and save employee data we are going to use the following IEmployeeRepository service. At the moment, we only have one method GeEmployee() that retrieves employee by ID. As we progress through the course we will add methods to Create, Update and Delete as well. The following MockEmployeeRepository class provides the implementation for IEmployeeRepository interface. At the moment, we are hard coding the Employee data in the MockEmployeeRepository class. 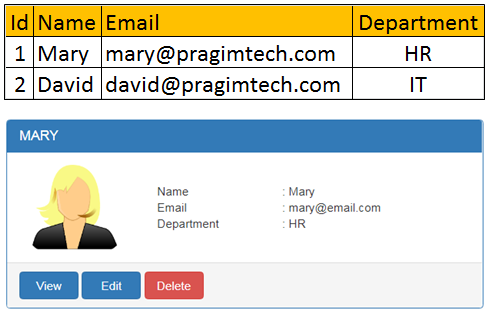 In our upcoming videos, we will provide another implementation for IEmployeeRepository interface, and that implementation will retrieve data from a SQL Server database. Throughout our application we will be programming against the interface IEmployeeRepository and not the concrete implementation MockEmployeeRepository. This interface abstraction allows us to use dependency injection which in turn makes our application flexible and easily unit testable. We will discuss Dependency Injection in detail in our next video. "Data Access layer" of application layers? It does not appear that we need any more classes in the Business logic and Data access layers.